We provide ice cream lovers with a unique flavorful experience by combining outstanding customer service and always local, fresh and organic ingredients. Liquid nitrogen is simply nitrogen (which makes up 78% of our atmosphere) in a liquid state. It is -321 degrees and obviously very cold. 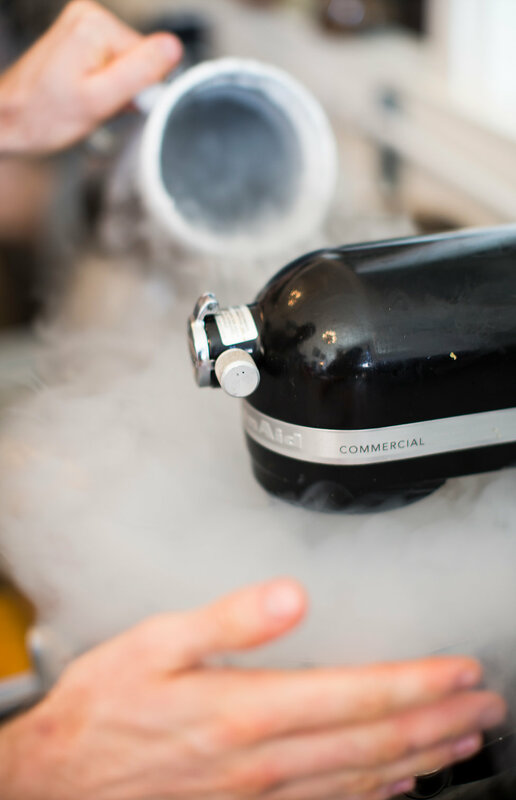 Using liquid nitrogen to rapidly freeze ice cream minimizes the size of the ice crystals and results in a much creamier ice cream. At Sweet Bee's we source fresh local ingredients from surrounding communities to craft our ice cream. Southern California has so many ingredients to offer and we love partnering with local farmers and purveyors to delight your palate. We use the finest dairy, Straus Family Creamery, which is 100% organic and oh so delicious! we Provide ice cream lovers with a unique flavorful experience by combining outstanding customer service and always local, fresh and organic ingredients.